12/7/2010Share this story on Facebook! Judges for the Creative Crunch listen to the pitch from the winning team. 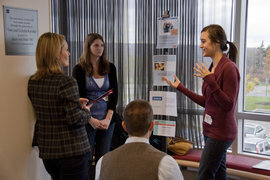 Ithaca College’s chapter of the American Advertising Federation is the place for students interested in advertising to learn more about the industry. Members can experience working with clients through Park ADVenue and be part of future Creative Crunch challenges. A sealed envelope was handed to the team captains of each of the nine teams signed up for the first ever Creative Crunch advertising competition, hosted by Park ADVenue, the Ithaca College chapter of the American Advertising Federation. With a “Good luck,” teams tore open their packet and began work on a campaign for their mystery client: Levi’s 501 Jeans. On November 6th, 35 total competitors, gathered in the Park School to compete for the $100 first place prize and recognition of being the winner of the inaugural competition. The teams were joined by three alumni judges, Benjamin Sear ’05, of Jay Advertising in Rochester, New York; Colleen Fitzgerald ’97, of Virgin Mobile in New York City; and Molly Isreal ’05, who recently began working for Ithaca College’s Marketing Communications team after a brief career with an ad agency. With exactly two hours to work on their campaigns, teams raced the clock to establish an idea and represent it in two print ads and a third execution of the team’s choice. This third execution ranged from the simple (social media integration and stickers) to the complex (pop up stores and augmented reality dressing booths). But in this competition the judges decided simple was best. Fall ’10 Creative Crunch winners Allyson Hotchkin ’11 and Mykal Urbina ’11, both integrated marketing communications majors, created a campaign building off the idea of social media tagging that would be identifiable with the target demographic of teens and young adults: “The Original Tag, Levi’s 501.” Simple, but memorable and the judges took note. The Creative Crunch was so successful that the decision has already been made to repeat the competition each semester. Park ADVenue hopes to increase the number of teams and competitors for semesters to come.